A.) You want to show your sweetie how much you love him/her this Valentine's Day by showering him/her with sweet, bite-sized treats that are cute, heart-shaped, and every other cloying adjective that can be used to describe the Feb. 14th holiday. B.) You're (still) single (again) and need an unhealthy dessert to accompany the bucket of Chinese food you'll be consuming while wearing black and watching Fatal Attraction at such a high volume that it drowns out the sound of your roommate making heart-shaped french toast for her "romantic blinner date." C.) You appreciate the food-on-a-stick genre. Examples include shish-kabobs, lollipops, popsicles, and anything found at the Wisconsin State Fair. **I discovered too late that I did not own any cookie cutters, so I cut a heart out of a thick piece of posterboard and used it as a stencil. Roll out your dough to about 1/8" in thickness. I suggest spreading more flour than usual on the rolling surface, this will help to lift the cut dough without it breaking. Using the cookie cutter (or stencil) cut out an equal number of shapes. 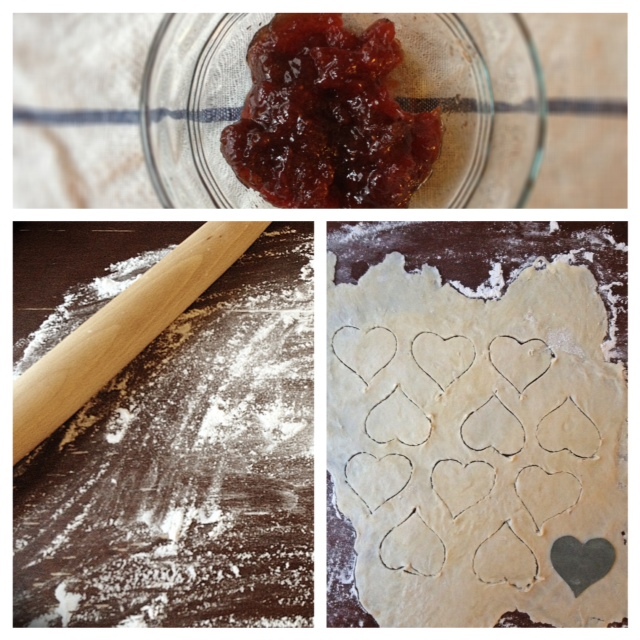 Place half the hearts on an ungreased cookie sheet. Press the wooden skewer into the bottom of each heart. Add a dollop of the fruit spread in the center (but only a small dollop! A little goes a long way), then top off with the second half of the hearts. It helps to run a little water around the edges of each bottom piece before sealing with the top half, as you want to make sure to firmly press the two edges together. 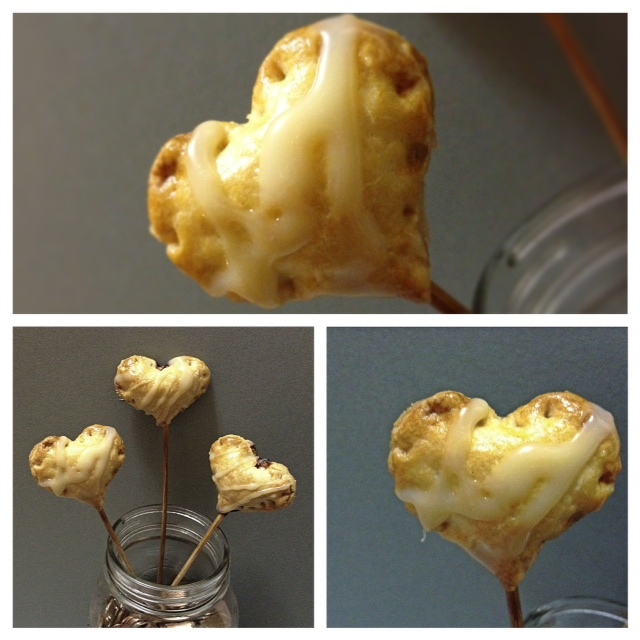 Use an extra skewer to press a decorative edge around the heart. Brush a coat of egg white wash over the top of each pop and bake for about 15 minutes, or until golden brown. While the pops are cooling, make the glaze - whisk together the chocolate, milk and sugar until creamy. Drizzle over the pops in a fun, decorative fashion. If you're feeling creative, you can add a bow, glitter, paint or sparkles to the sticks. The amount of flair you add to the pops is in direct corelation with the amount of love you have for the recipaint of the pie pops. 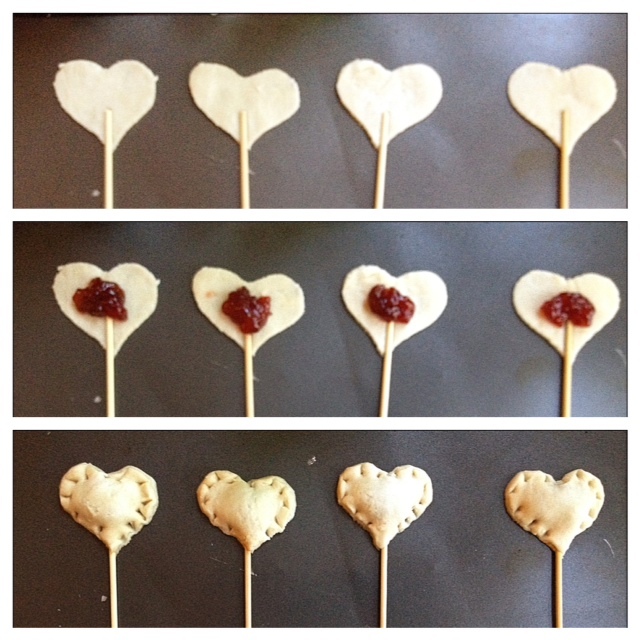 My pie pops did not have any such embellishments. 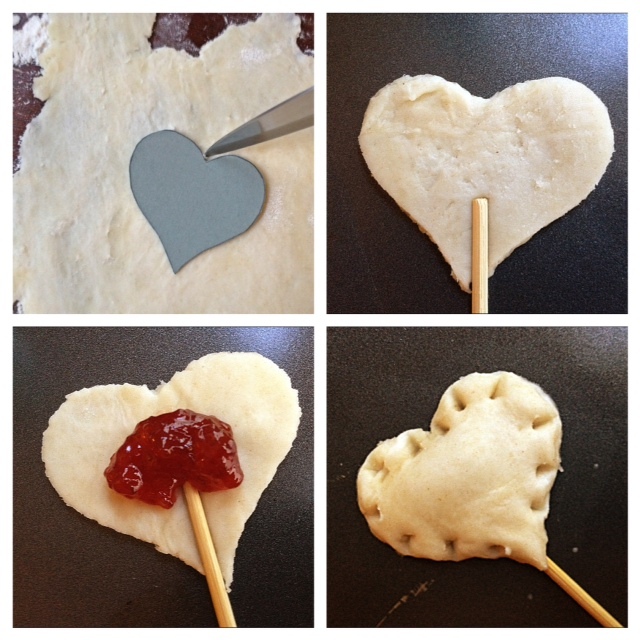 I got my inspiration for this post from three different sources - the William-Sonoma catalogue, my roommate who flipped through said Willam-Sonoma catalogue, and this site, which apparently came up with the idea for heart-shaped pie pops before anyone else. We're making these when you and Dee come over our house. No two ways about it.